Can you believe that Turkey Day is almost here? Neither can I. Today I wanted to share this recipe for the best, most perfect, Easy Sweet Potato Casserole. 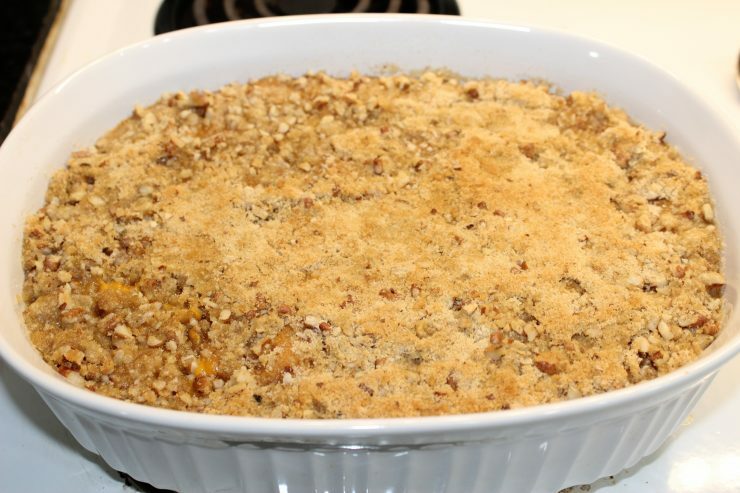 While we’re extolling the virtues of this Easy Sweet Potato Casserole, let’s not forget the crumb topping that will make you want to slap somebody! Just please don’t actually slap someone. 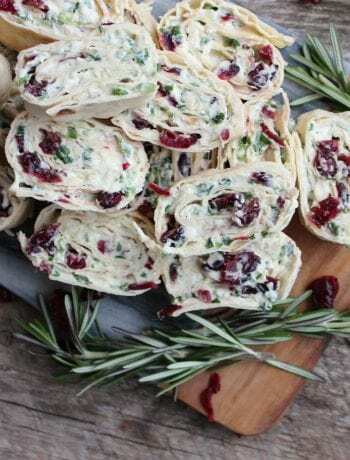 Especially not at the Thanksgiving dinner table – they just might slap you back. I’m sure some of you if not all of you probably grew up with a traditional sweet potato dish at your family Thanksgiving and Christmas dinners. If you didn’t grow up eating Sweet Potato Casserole, you likely grew up eating Candied Yams, Baked Sweet Potatoes or Sweet Potato Pie. While my mom’s family loved Candied Yams, I always found them too sweet for me as a kid, so I just assumed I didn’t like sweet potatoes. Then when I married my husband and tasted my mother-in-law’s Easy Sweet Potato Casserole, I had to re-valuate my previous decision. Let me just tell ya what you’ve probably already guessed, my mother-in-law’s Sweet Potato Casserole is THE BEST! Fortunately for you guys, she gave me permission to share it here with you all today, and I couldn’t be happier! I made a slight change to this recipe by adding cinnamon into the sweet potato blend because let’s be honest, you can never have too much cinnamon! Every year for Thanksgiving and Christmas I always ask (aka shamelessly beg) my mother-in-law to make this Sweet Potato Casserole and she always obliges. Some of us love the crunchy pecan and brown sugar streusel, and others love the toasted and gooey marshmallow topping. I love both toppings, but I have to say the Sweet Potato Casserole with pecans is my absolute favorite. Since my mother-in-law tries to make the whole table happy, she usually makes this Sweet Potato Casserole with half Pecan Streusel topping and half marshmallow topping. However you choose to top your Sweet Potato Casserole, I can guarantee it will wow the crowd and your friends and family will keep coming back for seconds! To make the perfect, Easy Sweet Potato Casserole, start out with three (very) large sweet potatoes or 4-5 sweet potatoes if they’re smaller. You need 4 cups of sweet potatoes once they’re all peeled and diced and my potatoes were huge, so 3 was plenty for me. Once your potatoes have been selected, you’ll need to peel the rough skins off. I like to use a potato peeler to peel my potatoes, but a good, sharp, paring knife will work as well. 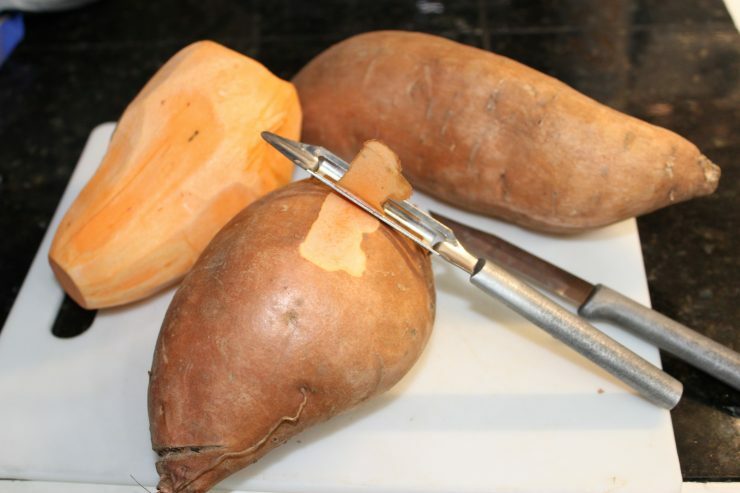 Once your sweet potatoes are peeled, you’ll be ready to dice them for cooking. Dice your peeled potatoes into medium sized chunks and place them in a large stock pot or sauce pan. 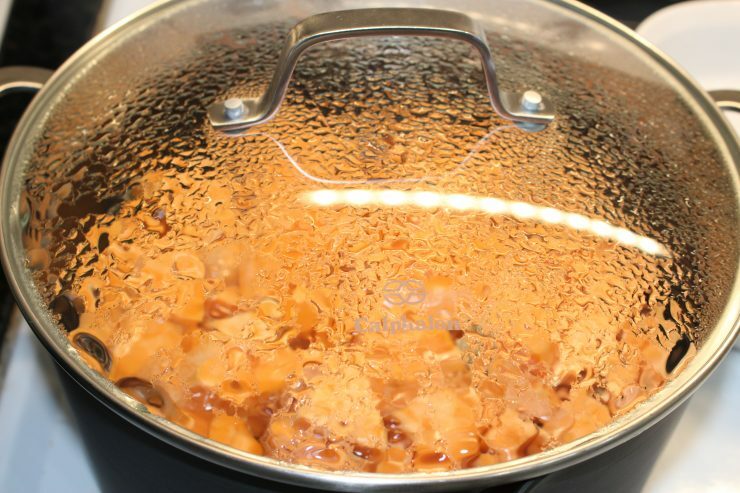 Fill the pan with water – just enough to completely cover the potatoes. Add a pinch of salt in with the potatoes, then cover the pot with a lid and set the heat to high. 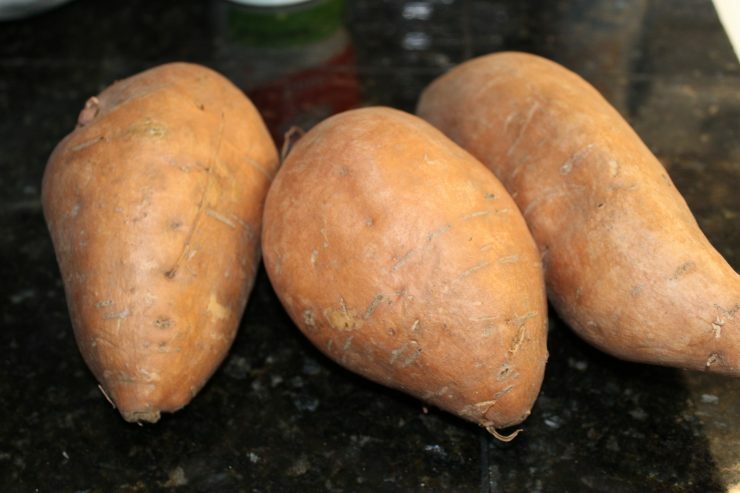 Boil the sweet potatoes until they are completely tender and falling apart. This boiling process will take about 15-20 minutes. If you want to skip this part for a really fast Sweet Potato Casserole, you can always used 4 cups of canned sweet potatoes, however, I highly recommend boiling fresh potatoes. Once the potatoes are boiled and completely tender, remove the lid and turn the heat off. Drain all water from the sweet potatoes and remove from the heat. 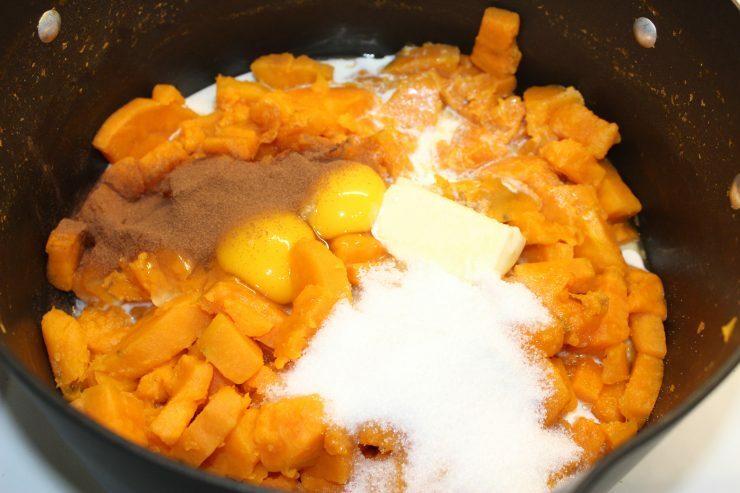 Now that your sweet potatoes are cooked and tender, it’s time to move on to adding the other ingredients. Add in 2 raw eggs and 4 tablespoons of butter, along with 1/4 cup of heavy whipping cream. Eggs in Sweet Potato Casserole might seem a little strange but they act as a binding and thickening agent to keep the casserole nice and fluffy without being a watery, mushy mess. The eggs in the Sweet Potato Casserole hold everything together so the casserole keeps it’s shape. Now we’re going to sweeten things up a bit by adding in 1/2 cup of white, granulated sugar. 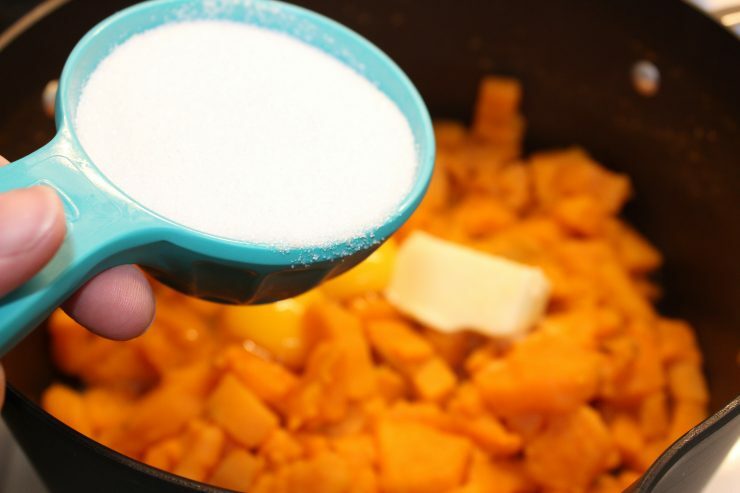 If you’re concerned with the sugar content you could replace the sugar for Splenda or simply reduce the amount of sugar for a less sweet casserole. Now that you have tender sweet potatoes mixed with butter, eggs, sugar, and heavy whipping cream, add in 1/2 teaspoon of ground cinnamon. If you read just a few lines above, you already know that adding eggs to Sweet Potato Casserole works as a binding and thickening agent. If you are tempted to skip the eggs in this casserole, please don’t! 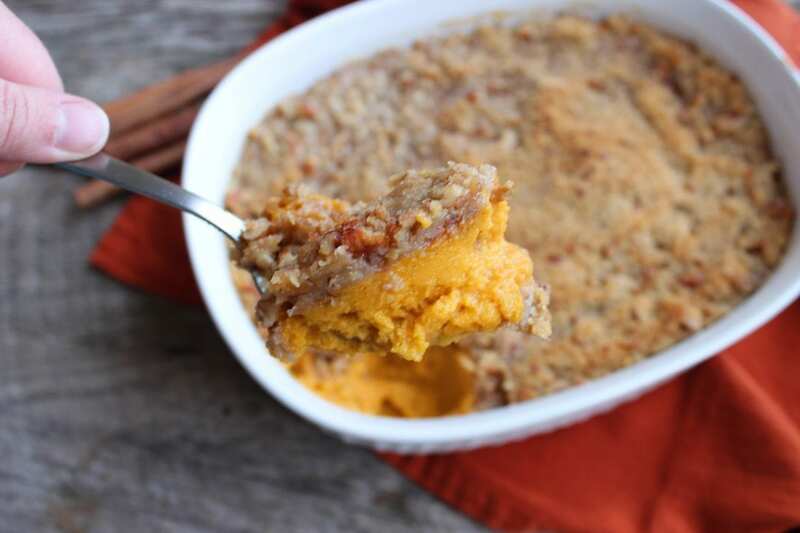 Eggs are a great way to thicken your Sweet Potato Casserole and give it just the right consistency. Use a spatula to stir all of the ingredients together in the pot, mixing and beating the two eggs in as you go. Be sure that all ingredients are stirred well and combined! This is where you’re going to take these sweet potatoes from good to absolutely slap somebody outstanding. 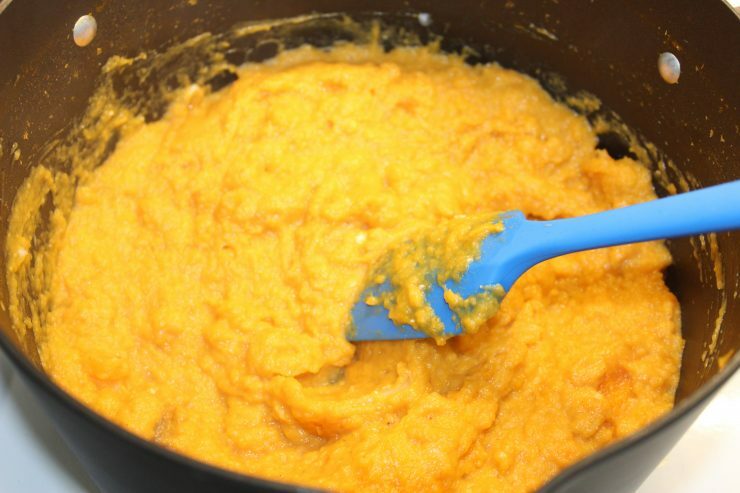 An immersion blender is handy here to blend this sweet potato mixture. Blending this mixture is the key to getting this Easy Sweet Potato Casserole so smooth, creamy, and delicious! 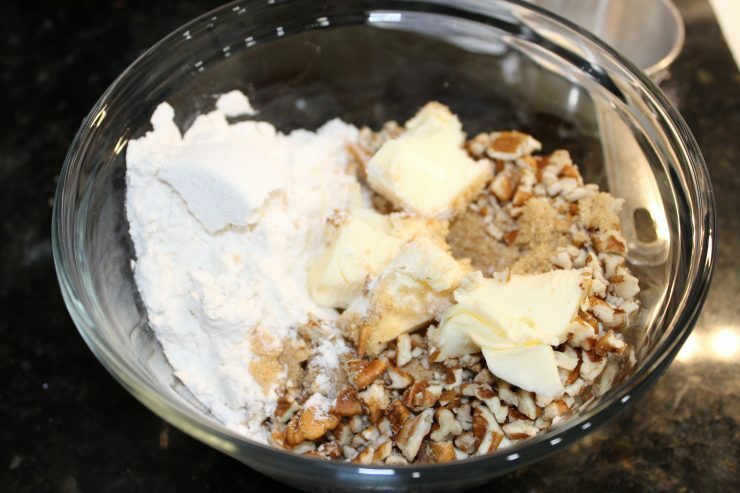 Time to make the pecan streusel topping! 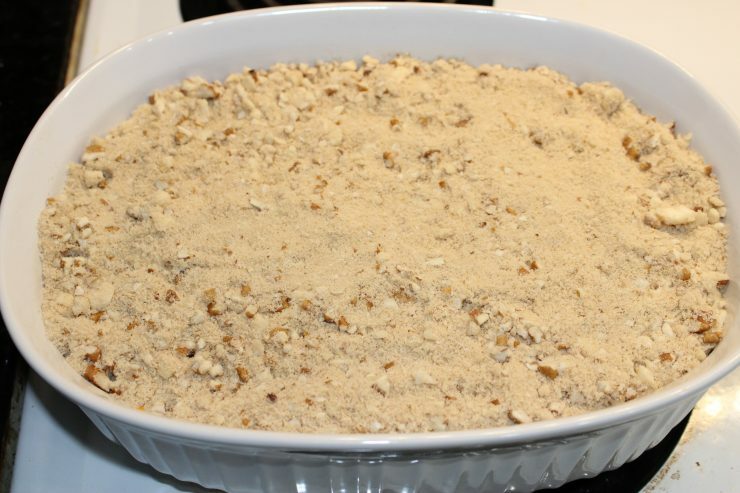 You’ll need: 1/2 cup brown sugar, 1/3 cup all purpose flour, 3 tablespoons butter, and 1/2 cup chopped pecans. Combine all of the above ingredients in a small mixing bowl. Use a butter cutter to cut the butter into the ingredients in the bowl. If you’re country folk like me and don’t own a butter cutter, use a biscuit cutter to cut the butter into your streusel mixture. Just cut and “chop” until the butter is in small pieces, then use a spatula to stir this mixture together to combine. Once the pecan topping is made for the Sweet Potato Casserole, spray a 2 1/2 quart casserole dish with nonstick cooking spray. 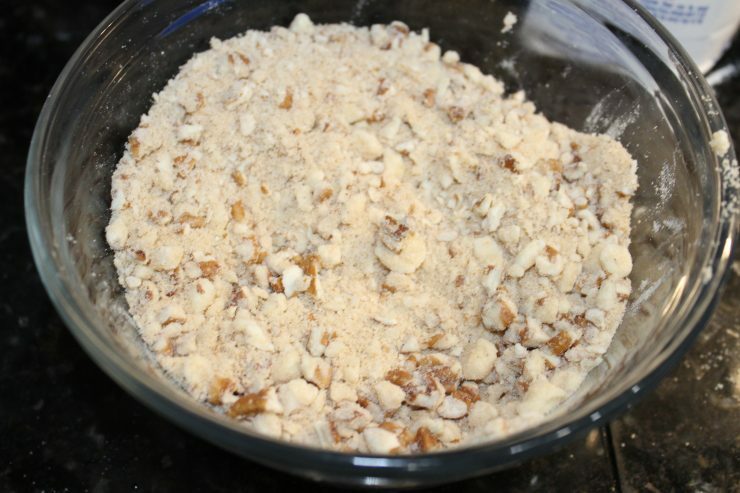 Pour the Sweet Potato Casserole mixture in the dish and then top it evenly with the pecan topping. You can also top this casserole with 2 cups of miniature marshmallows if you prefer. 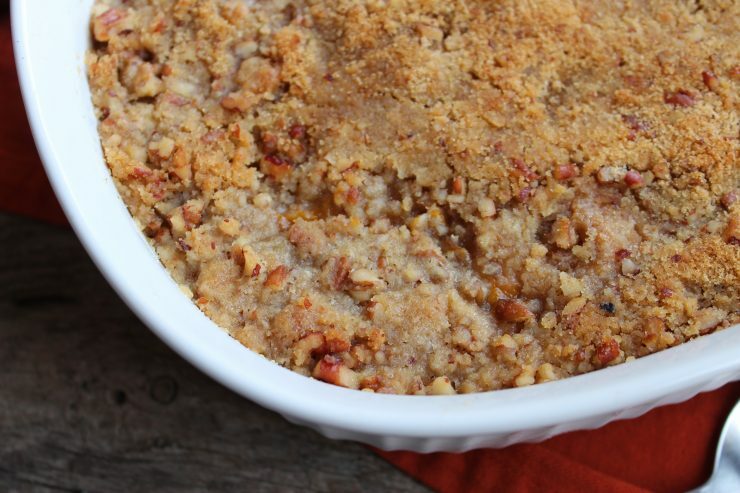 If you’re making this Sweet Potato Casserole ahead of time, don’t add the topping! 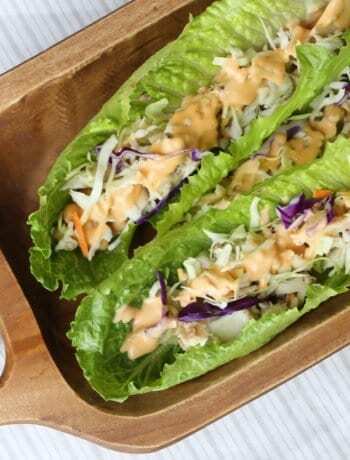 Just cover the casserole with plastic wrap and store in the fridge. The day you bake the casserole is when you’ll add the topping. If you’re not making this Easy Sweet Potato Casserole in advance, or even if you are, add the topping to the Sweet Potato Casserole. Once the topping is added, place the Sweet Potato Casserole in the oven and bake at 325F for 30 minutes. 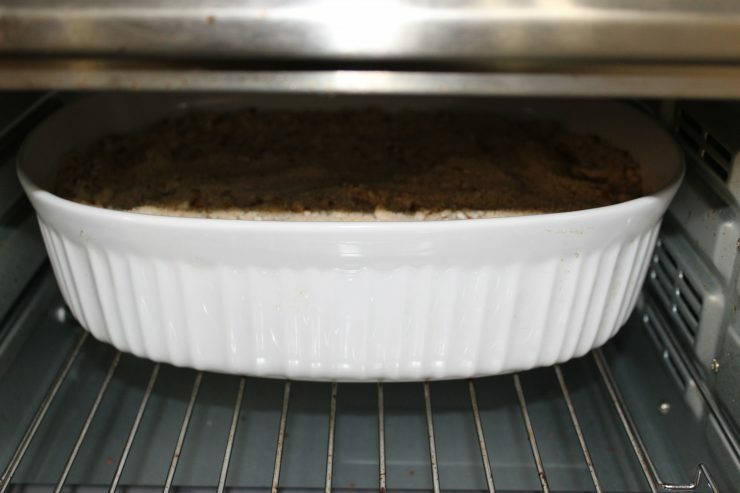 If you had this casserole in the refrigerator prior to cooking, you may need to cook it for an additional 10 minutes just so it heats through. Once cooked, carefully remove the sweet potato casserole from the oven and serve hot! If you have any leftovers, this Easy Sweet Potato Casserole will need to be store in an airtight container in the refrigerator since it contains eggs and milk. If you saved some leftovers and you want to re-heat them, you can use a microwave to get them hot fast. Using a microwave won’t change the taste or texture of this casserole and it will be delicious and fresh once heated! If you don’t want to use a microwave, you can also use a small conventional oven to heat it back up. I’ve seen a lot of questions asked as to whether or not Sweet Potato Casserole is a dessert, so I wanted to address that. 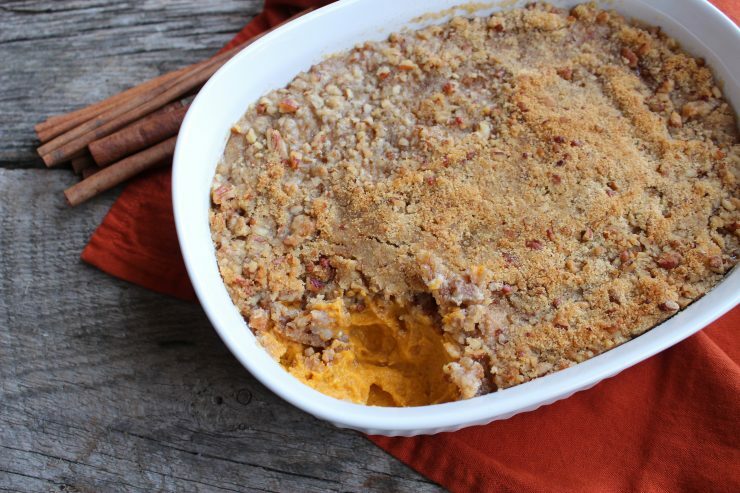 Traditionally, Sweet Potato Casserole isn’t served as a dessert here in the South. Sweet Potato Casserole is a traditional, Southern Thanksgiving and Christmas side dish and we serve it right alongside the turkey and Broccoli Cheese and Rice Casserole. 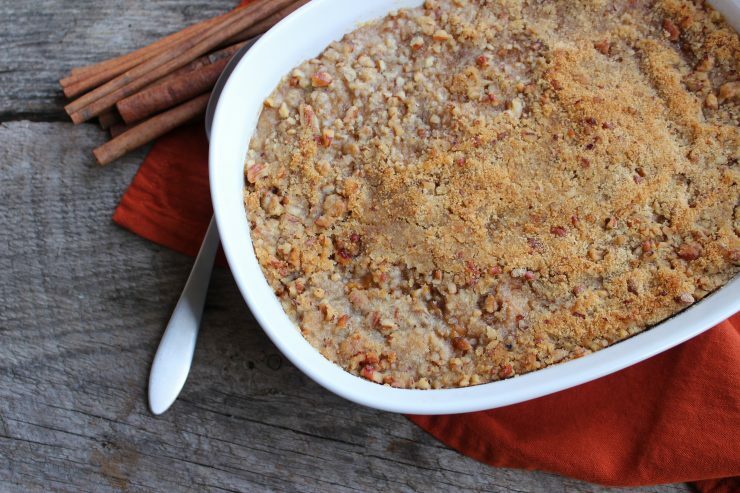 I hope you’ve had fun today making Easy Sweet Potato Casserole with me! 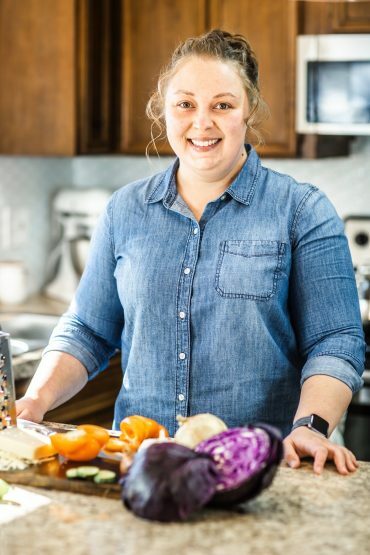 I feel confident enough in this recipe that I can guarantee it will be the best Sweet Potato Casserole you’ve ever made. 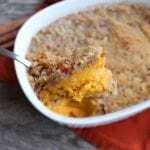 Easy Sweet Potato Casserole is a sweet and creamy traditional Thanksgiving and Christmas side dish with a crunchy pecan streusel topping. 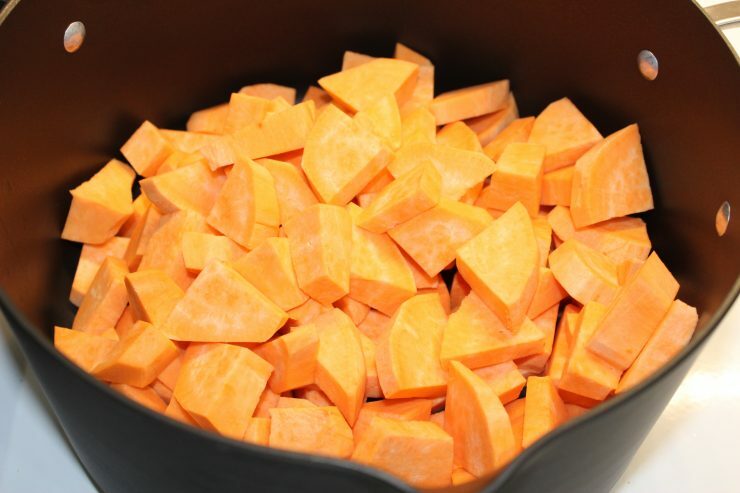 Place the peeled and diced sweet potatoes in a large stock pot and fill the pot with water, just enough to cover the sweet potatoes. Add a pinch of salt and cover the pot, turning the heat to high. 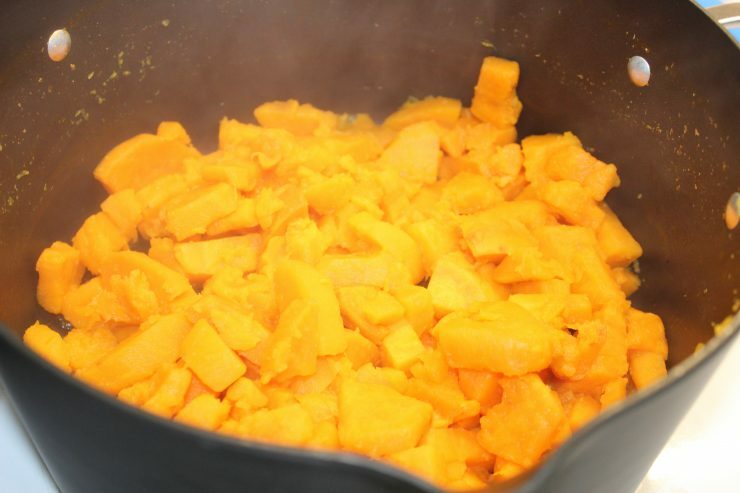 Boil the sweet potatoes for 15-20 minutes or until completely tender and falling apart. 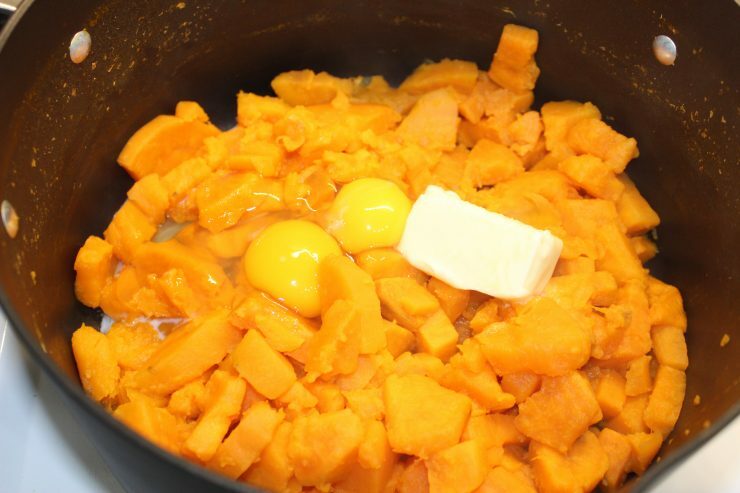 Drain all water from the sweet potatoes, then add in the eggs, sugar, butter, heavy cream, vanilla and ground cinnamon. Stir all ingredients together with a spatula, beating the eggs in as you go. 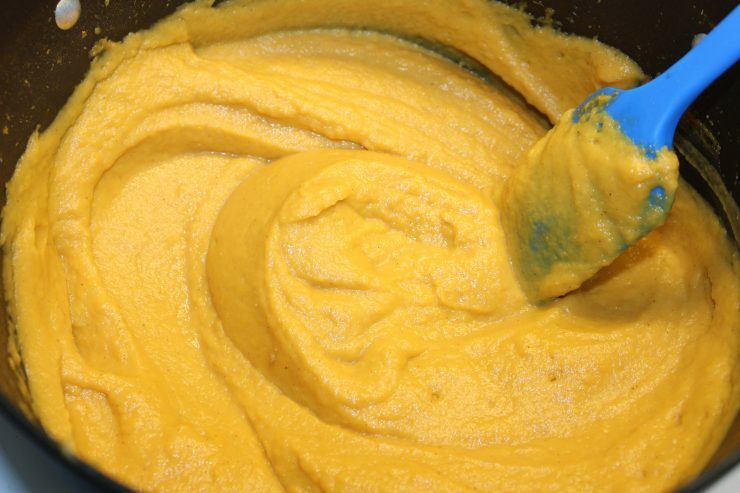 Use an immersion blender to blend the sweet potato mixture until completely blended and totally smooth. Spray a 2 1/2 quart casserole dish with nonstick cooking spray and pour the sweet potato mixture into the dish. If you're making this ahead of time, cover the dish with plastic wrap and store in the fridge, adding the Pecan topping the day you bake it. Combine all ingredients for the topping in a small mixing bowl and cut the butter into the mixture using a butter cutter or biscuit cutter. Once the butter is chopped into fine pieces, use a spatula to stir the ingredients together. Sprinkle the topping over the Sweet Potato Casserole and bake in the oven at 325F for 30 minutes or slightly longer if you've had the casserole stored in the fridge. Carefully remove from the oven and serve hot. 2 cups of miniature marshmallows can be used for the topping if you prefer. 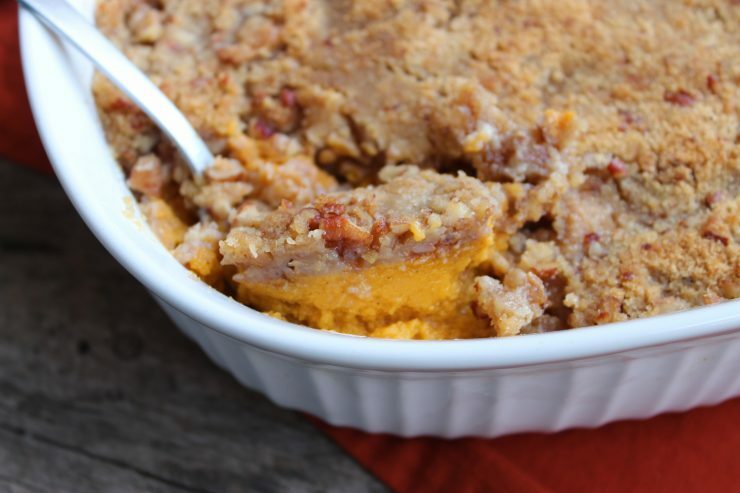 Your Sweet Potato Casserole will be a great side dish for the upcoming holiday meals! 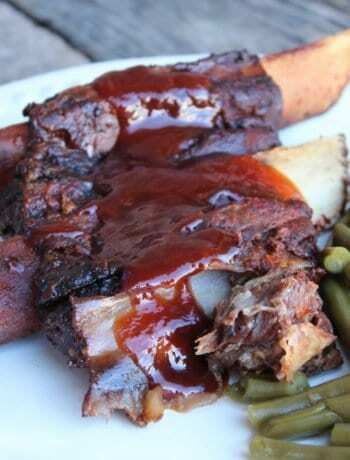 Thanks so much for sharing with us at Full Plate Thursday and come back to see us real soon! Thank you Miz Helen! Hope you have a wonderful week! Thanks for sharing at the What’s for Dinner party! Have a great week and hope to see you again next week.